NTT Communications announced two major international investments: the acquisition of Virtela for US$525 million in cash, and the acquisition of an 80% stake in RagingWire for US$350 million. Virtela Technology Services (Virtela), which is based in Denver, is a leading global managed and cloud network services provider serving over 500 multinational companies. Virtela integrates 1,000+ local and regional network providers, enabling the customer to build a virtual overlay network from multi-carrier MPLS, Ethernet, DSL, 3G/4G/LTE and other IP links, while benefitting from a single SLA and management portal. 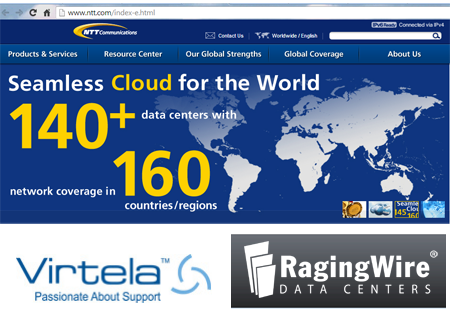 Virtela operates global operations and delivery centers in the U.S., India and the Philippines. It has over 400 employees. NTT Com said it plans to combine Virtela’s advanced service/operational platforms and expertise with its own global ICT infrastructure and resources. 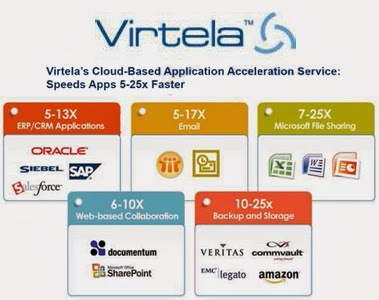 NTT Com will also upgrade its cloud-based network services with Virtela’s network function virtualization (NFV) technology to virtualize the functions of customers’ network equipment, such as firewalls and WAN accelerators, enabling enterprises to benefit from instant service activation and significant cost reduction. "Virtela is well known for its strong technology, networking expertise, global reach and highly regarded services," said Akira Arima, CEO of NTT Com. "As we advance our Global Cloud Vision, we expect to continue offering enterprise customers the highest possible value in services ranging from branch office networking to large-scale cloud migration." "Virtela’s virtualized network services model combined with NTT Com’s brand and strength will create the industry’s most advanced services portfolio that enables enterprises to break free from the constraints of traditional network architectures and services," said Vab Goel, Virtela founder and general partner at Norwest Venture Partners. Separately, NTT Communications will acquire approximately 80% equity interest in RagingWire Data Centers (RagingWire), a leading provider of data center services in the United States. RagingWire has 650,000 square feet of data center space at its campuses in Sacramento, California, and Ashburn, Virginia. Both campuses are currently being expanded. In addition, RagingWire has begun construction of a new 150,000 square foot data center in Sacramento and will soon break ground on a 78 acre parcel of land in Ashburn, Virginia with designs to build 1,500,000 square feet of data center space. The company has annual revenues of approximately $85 million (USD), and a compounded annual growth rate of 30%. NTT Com said the acquisition will more than double its data center space in the U.S. In September 2013, RagingWire Data Centers closed on a $230 million credit facility to fund its strategic growth plan and ongoing expansion of its data center campuses in Sacramento, California and Ashburn, Virginia. The funding was led by Bank of America Merrill Lynch, co-led by Comerica Bank, and included eight financial institutions in total. RagingWire noted that its 500,000 square foot data center campus in Sacramento is almost entirely full and plans are underway for an additional facility in the area. 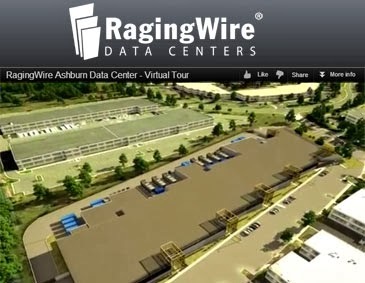 In Ashburn, Virginia, the heart of “Data Center Alley,” RagingWire has five data center vaults within a 150,000 square foot facility and plans to build a 1,500,000 square foot campus on 78 acres of land in Ashburn that the company recently acquired. NTT Communications was among the first Service Providers to implement SDN. The company has a Global Cloud Vision encompassing many of its enterprise services. 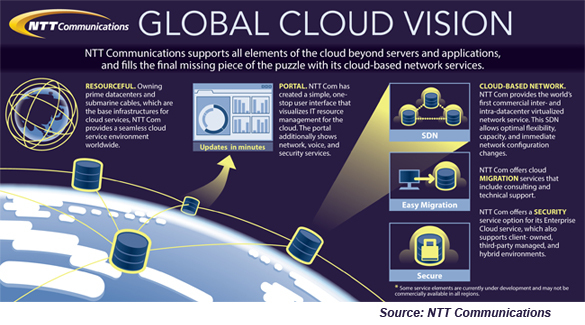 In June 2012, NTT Communications launched a globally seamless enterprise cloud service using OpenFlow network virtualization technology within and between data centers. The service was launched via NTT Com data centers in Japan and Hong Kong, followed by data centers in the United States (two locations), the United Kingdom and Singapore in December and in Australia, Malaysia and Thailand in March 2013. The FCC adopted technical service rules, including power limits and other technical parameters, to govern the spectrum for First Responder Network Authority (FirstNet) nationwide wireless broadband system. The rules are intended to provide a foundation for FirstNet's operations, help avoid harmful interference to spectrum users in adjacent bands, and expedite the availability of equipment for use on the public safety network, thereby fostering competition and innovation in the marketplace. The has granted a license to FirstNet for the combined use of two spectrum blocks -- one block that was previously designated for public safety use (763-768/793-798 MHz) and a second, spectrally adjacent block (758-763/788-793 MHz). The FCC said this action consolidates the technical requirements governing both spectrum blocks into a uniform set of rules, which will provide vendors with specifications they need to develop equipment for use on this spectrum. The FCC's Office of Engineering and Technology will now begin accepting and processing applications for equipment certification in this band, consistent with the newly consolidated rules. The FCC endorsed a voluntary industry agreement that will establish interoperable LTE service in the Lower 700 MHz band and adopted and an Order that modifies the technical rules of the D and E blocks. The FCC said its new rules remove the likelihood of harm caused by attendant power levels while continuing to allow high-value uses of the D and E blocks. The order also proposes to modify AT&T's B and C block licenses to incorporate the commitments of AT&T and makes changes in construction requirements and deadlines for various E Block licensees in the Lower 700 MHz band. The Lower 700 MHz interoperability agreement was brokered by several wireless providers, along with the Competitive Carriers Association. The FCC expects it will give consumers more choice in using their devices with large and small carriers alike and will promote widespread deployment of mobile broadband services, especially in rural areas. "After many frustrating years, wireless carriers have finally reached a voluntary industry solution that will resolve the lack of interoperability in the lower 700 MHz band in the most efficient manner. This is a big win for consumers, especially in rural areas, who will see more competition and more choices. Also, by making it easier for small wireless carriers to compete, today's interoperability solution will spur private investment, job creation, and the development of innovative new services and devices. "That's why for the past few years, I have been consistent in pushing for a final resolution to this issue. Thank you to all the parties - AT&T, The Interoperability Alliance, The Competitive Carriers Association, DISH, and the consumer advocacy groups - who came to the table and worked collaboratively with FCC staff to hammer out a solution that benefits all consumers." Nokia Solutions and Networks is reinforcing its multi-stack approach to telco cloud to give operators full flexibility in their choice of cloud platforms. The company confirmed that it is working closely on cloud technology with major operators, leading cloud stack vendors such as VMware, open source cloud platforms such as OpenStack and the ETSI Network Functions Virtualisation (NFV) Industry Specification Group (ISG). NSN cited recent trials and proof of concept projects with Tier 1 operators that demonstrate the reliability of its core virtualization. The tests also show its capability to adapt cloud IT platforms to meet the demands of telco cloud. “NSN supports multiple stack solutions such as OpenStack and VMware,” said Thorsten Robrecht, VP of MBB Portfolio Management at NSN. “As well as enabling operators to increase the flexibility and agility of core network infrastructure, we are committed to creating a telco cloud ecosystem that supports the co-existence of traditional networks and cloud environments and gives operators the option of choosing the most competitive hardware and cloud platform for their specific needs. NSN has also launched its cloud-ready NetAct 8 , which helps simplify network operations, reduce operational expenses and deliver very high availability. NetAct 8 includes the NSN Cloud Application Manager, which provides off-the-shelf management, orchestration and elasticity for virtual network functions. China Telecom Corporation Ltd. Beijing Research Institute carried a terabit wavelength over a distance of 3,200 kilometers on G.652 optical fiber without Raman amplification that was error-free for 24 hours. The world record demonstration used ZTE’s ZXONE 8700 WDM platform and advanced Nyquist WDM Terabit PM-QPSK optical modulation and optical coherent detection technologies. The system leveraged ultra-high-speed signal processing and soft-decision forward error correction algorithms, achieving spectral efficiency of 4bit/Hz/s. 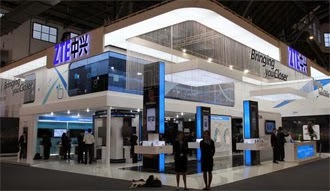 ZTE said this latest demonstration strengthens its global leadership in terabit optical transport systems. In 2012, ZTE and Deutsche Telekom successfully completed 100G/400G/1T long-haul transmission over 2,450 kilometers, setting a record in long-distance multi-rate mixed transmission. ZTE has successfully deployed more than 50 100G trial and commercial networks globally. ZTE noted that it achieved record revenue in optical network products in the second-quarter of 2013, achieving the industry’s fastest growth rate in the preceding 12-month period, according to data from research company Ovum. Telstra has completed a test LTE Broadcast session on its commercial LTE network using Ericsson's solution. During the demonstration, end user devices received different video feeds, including a sports match replay, sporting network news, horse racing coverage and news. Additionally, the devices received a large file using the single LTE Broadcast channel. The trial devices used Qualcomm Labs' LTE Broadcast SDK and middleware running on Qualcomm Snapdragon processor and integrated modem platforms. 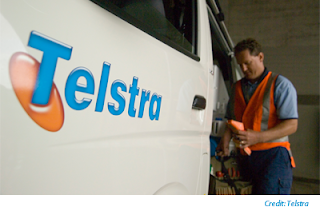 Mike Wright, Telstra Executive Director, Networks said: "The trial is an important step in testing this technology to see how it provides network efficiencies while providing consumers the content they want in a high-quality experience. Our goal is to ensure consumers can get the content they are looking for easily and to explore the wider benefits that might be obtained using broadcasting technology." Thomas Norén, Vice President and Head of Project Area Radio, Ericsson says: "LTE Broadcast provides the ability to send the same content simultaneously to a very large number of devices in a target area. Mobile operators can use this ability and monetize their media and network assets for new services. Revenue generation and cost-saving opportunities are significant and provide an attractive value proposition for mobile operators." Telefónica I+D, the research and development company of the Telefónica Group, and Oracle have completed a process of definition, developing and testing to allow Oracle’s Tekelec Policy Server (PCRF) to extend mobile policy management to fixed broadband networks. 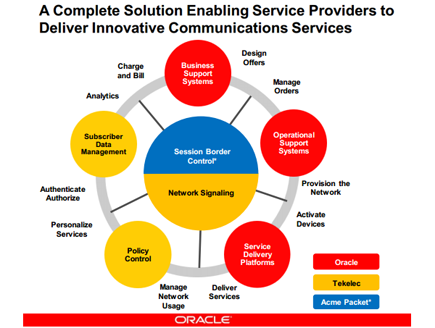 The work paves the way for the use of Policy Server and Oracle’s Tekelec Subscriber Profile Repository (SPR), or subscriber database, in a fixed-mobile convergence (FMC) environment. The test was developed in Telefónica I+D’s properties, where some business case scenarios were prepared in order to verify the FMC capabilities of the Oracle solution. Oracle said the work has produced a solution that sets out the key next-generation policy management requirements and handles a more diverse set of subscriber-centric rules. “Service providers have a tremendous untapped potential to create and offer new innovative broadband data services that both increase revenues and increase customer loyalty,” said Albert Fernandez, Senior Director, Europe Sales, Oracle Communications. ZTE has selected Freescale’s QorIQ Qonverge BSC9132 “base station-on-chip” for TD-LTE femtocell products. The small cells are to be deployed starting later this year.